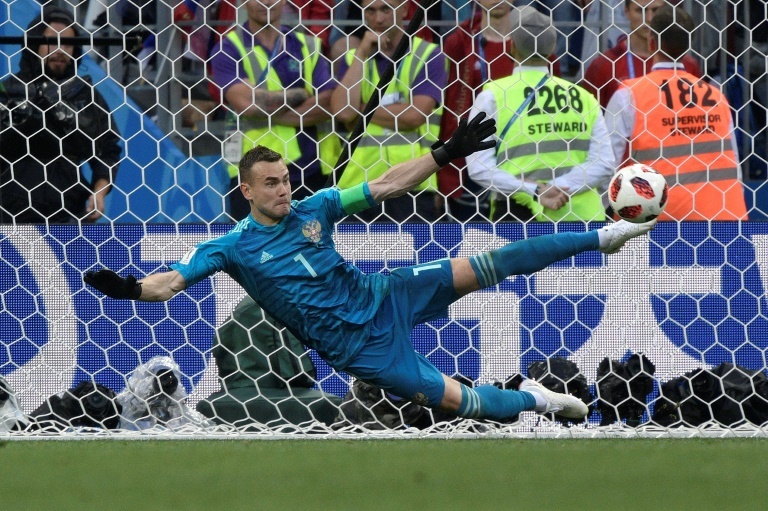 "We are having a fantastic World Cup," said Akinfeev. "Not just our fans, but the fans of other countries got a sense of this atmosphere and understood that Russians really know how to play football and want to play football." Russia will meet either Croatia or Denmark for a place in the semi-finals, as Spain's rotten run against hosts nation at major tournaments continued. Aleksandr Golovin carved out their first chance of note, starting a move with a jinking run before bending just wide of David de Gea's left-hand post. Isco produced a series of regal touches with Spain's King Felipe VI among those in the crowd at the Luzhniki Stadium, but Russia equalised shortly before half-time. Aspas nearly picked out Carvajal with a cut-back seconds into the start of extra time, which saw Aleksandr Erokhin come on as Russia's fourth sub -- the first time the rule has been applied at the World Cup. Russia endured a tense wait when Kuipers was in communication with the video assistant referee following a late tug on Pique in the box, before Akinfeev's shootout heroics clinched an unforgettable triumph.